Hong Kong boasts a number of rich archaeological sites behind sandy bays. Among these backbeaches is Sha Po on Lamma Island, a site which has long captured the attention of archaeologists. However, until now no comprehensive study of the area has ever been published. Piecing Together Sha Po presents the first sustained analysis, framed in terms of a multi-period social landscape, of the varieties of human activity in Sha Po spanning more than 6,000 years. 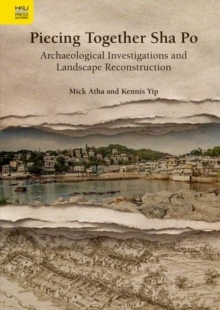 Synthesizing decades of earlier fieldwork together with Atha and Yip's own extensive excavations conducted in 2008-2010, the discoveries collectively enabled the authors to reconstruct the society in Sha Po in different historical periods. The artifacts unearthed from the site-some of them unique to the region-reveal a vibrant past which saw the inhabitants of Sha Po interacting with the environment in diverse ways. Evidence showing the mastery of quartz ornament manufacture and metallurgy in the Bronze Age suggests increasing craft specialization and the rise of a more complex, competitive society. Later on, during the Six Dynasties-Tang period, Sha Po turned into a center in the region's imperially controlled kiln-based salt industry. Closer to our time, in the nineteenth century the farming and fishing communities in Sha Po became important suppliers of food and fuel to urban Hong Kong. Ultimately, this ground-breaking work tells a compelling story about human beings' ceaseless reinvention of their lives through the lens of one special archaeological site.